From 4 April 2018, families will be able to travel to the Dutch capital from London by Eurostar, with the international high-speed rail link taking just three hours and 41 minutes. Alternatively, London–Rotterdam will take a whisker over three hours. Trains from St Pancras International Station in London to the Netherlands will reach speeds of up to 300kph. The new service also reduces the London–Brussels journey time from two hours and five minutes to one hour 48 minutes. 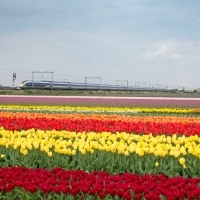 A Eurostar journey from London to Amsterdam emits 80% less carbon than the equivalent short-haul flight, making it a great choice for green family travel. Other benefits are city centre to city centre travel, fast check-in (passengers can arrive just 30 minutes before departure) and a generous, free luggage allowance. Tickets to Amsterdam will go on sale on 20 February, costing from £35 one-way. Two trains a day will depart from London, at 8.31am and 5.31pm. Read more about family city breaks in Amsterdam, including things to do with kids and our hand-picked recommendations for family-friendly places to stay and eat.